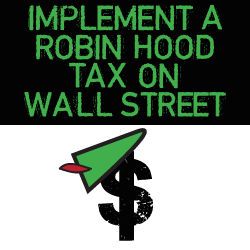 The Robin Hood Tax, or the Financial Transaction Tax, would be a small tax on speculative financial transactions on Wall Street, that includes stocks and shares, the buying and selling of currency, and other financial assets. The tax offers a mechanism that can raise much-needed revenue for the U.S. government and arguably enhance the efficiency of our markets, while at the same time curbing speculative activity that destabilizes our economy. Economists estimate that a tax of 0.5% on stocks, 0.1% on bonds, and 0.005% on derivatives could raise between $150 and $350 billion a year! This money could be used not only for global health programs, but for infrastructure development, job creation, student debt reduction, education, healthcare climate change prevention and environmental protection. Proposals for an FTT have received support from a range of European, U.S. and African leaders, as well as economists, business leaders, and civil society organizations. The FTT has been implemented in a variety of settings – it’s used in over 40 other countries including the United Kingdom where it raises more than £3 billion each year. Eleven European Union countries are currently adopting an FTT. The United States had an FTT from 1914 until 1966, and there is now a growing call not only from advocates and activists, but from economists, business-leaders, and political leaders to reinstate it. Representative Keith Ellison (D-MN) has introduced “HR 1579: The Inclusive Prosperity Act” in Congress, which calls for the tax that we want! We need more Congress members to co-sponsor the legislation and advocate not only for a financial transaction tax, but for one at the level we’re asking for (0.5%)! Meet with, call, write to your legislators to get them to cosponsor HR 1579. Host a town hall on your campus to encourage other student groups to work with you on this campaign. Ask other groups on campus to cosponsor the event with you – including environmental, labor rights, healthcare, education reform, and student debt activists. This is a campaign that most students will get behind! Invite these groups to take part in Robin Hood Tax actions together as a coalition.